Enhancing the sustainability of sensory farm visits discussed at the Let Nature Feed Your Senses Conference | LEAF’s EBrief 26th November 2013 | EISA e.V. What can farmers learn from science to improve the nutrition of our food? Alongside my work at LEAF, I am truly honoured to have been awarded the Frank Arden Nuffield scholarship to study the opportunities for farmers to improve the nutrition of our food through science. I present my findings in April next year, alongside David Northcroft from Waitrose who is also addressing the same topic. But what an unbelievably interesting area this all is! For me it has started with a whole new vocabulary of nutrient density, bio- fortification and functional food, amongst countless others, so clearly demonstrating the huge and complex food web that farmers are such a small, but significant part of. The challenge is getting more money pre-farm gate and I have had the opportunity to discuss and meet with scientists, nutritionists, farmers and enthusiasts from Italy, Canada, Taiwan, Brussels, and more. My recent trip to Taiwan has been particularly interesting and the generosity and kindness of the people there was overwhelming. I haven’t found all the answers yet but there are some definite pointers that I will be highlighting in my report. If you are particularly interested in this area, or indeed have thoughts, ideas and evidence that may be able to support my study, please do not hesitate to get in touch, thank you. Over the last 4 1/2 years, the Let Nature Feed Your Senses project has delivered sensory farm visits for 14,100 visitors across England. 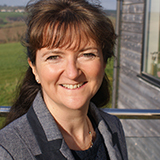 In 2013, the focus of the project has been on enhancing the sustainability of visits, and on 20th November 100 people attended the project’s annual conference in Birmingham to hear how farm visits can be sustained when project funding comes to an end. Gavin Atkins from MIND’s ‘Eco-Minds’ programme led a workshop on ‘the way into health commissioning’; Corri Waitt from FarmAbility explained how she has promoted her care farming services to individuals with personalised budgets; Beren Aldridge from Growing Well introduced the new Care Farm UK Code of Practice; Denys Fell from Densholme Care Farm shared his success at making links with local sponsors; and Rachel Bragg from Essex University discussed the importance of gathering and utilising evidence of impact. Jonathon Gardner from New Economics Foundation Consulting presented findings from his research with two mental health support groups, showing that significant savings to the state can be realised from a series of farm visits. A further focus of activity this year has been on action research, which has involved developing inclusive research tools on eight farms. Three host farmers shared their learning at the conference, and a report detailing action research learning will soon be available on the project website (www.letnaturefeedyoursenses.org). 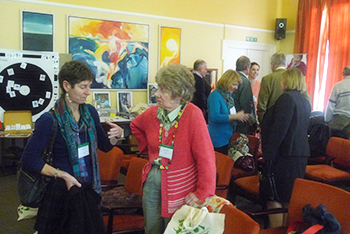 The project’s new poetry kits were also launched at the conference. For more information, please contact the Let Nature Feed Your Senses Project Team. There will be a full write up of the conference available on the Let Nature Feed Your Senses website shortly, in the meantime you can check out this write up of the project on the Farmer’s Weekly website. 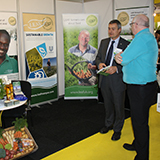 Farm Business Innovation Show, 28 and 29 November, Hutchinsons Winter Technical Farmer Conference, 3rd December, Sainsbury’s Farming Conference 2013, 6th December, Oxford Farming Conference, 7th and 8th January. Full details of all events are available here. New reports and articles are increasingly pointing to water risk as one of the biggest issues associated with climate change, energy production, food security, and human health. 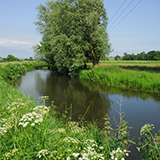 This webinar will outline the role of agriculture in the water cycle and how to identify, prioritise and respond to agriculture associated water risks in your business. Click here to register for this free webinar with 2degrees. Our annual President’s Event discussed and debated some of the current and future big issues in sustainable agriculture. 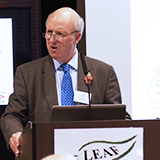 Speakers’ presentation slides from the event are now available alongside a full report from the day and a full live commentary, both written by LEAF Trustee, Cedric Porter. Videos of the talks will be added shortly, click here to check it all out! You have received this email because you have subscribed to LEAF’s EBrief, if you no longer wish to receive news from LEAF please unsubscribe using the link below.If you have any enquiries please do not hesitate to contact us using any of the details to the left.